His critics will say this unfortunate photo reveals a deeper problem with his presidency — that he’s just a walking teleprompter. 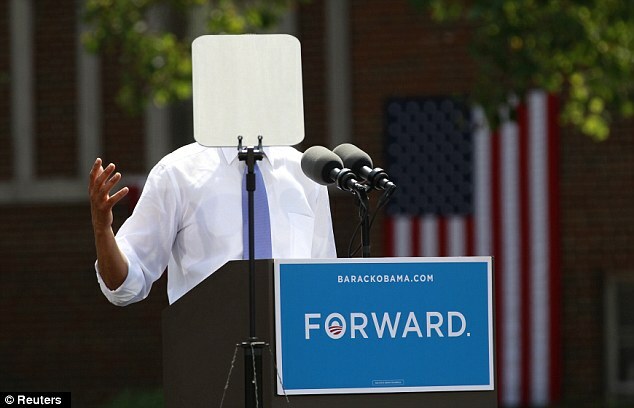 A Reuters photographer captured a shot of Barack Obama with his face obscured by a teleprompter during a campaign event at Capital University in Columbus, Ohio, on Tuesday. The Drudge Report suggested that the shot was ‘rude.’ At the very least, it’s been raising eyebrows. For just one moment, through one camera lens, the President of the United States turned into a teleprompter. He was at the suburban Ohio college to speak about the rising cost of college, but the medium seemed to get in the way of his message — literally. The Food and Drug Administration has received dozens of reports about harmful side effects – including stroke and death – linked to two dietary supplements currently on the market, Reumofan Plus and Reumofan Plus Premium. The agency has issued a safety alert to warn consumers about the dangers of the supplements. They are both marketed as natural dietary supplements but the FDA claims they have potentially dangerous active ingredients that aren’t listed on their labels. The supplements are used to treat arthritis, osteoporosis, muscle pain, bone cancer and a host of other ailments. They are manufactured in Mexico by Riger Naturals, but sold in the United States in some stores, Internet sites and flea markets. Most are labeled in Spanish but there could be versions with English labels. A Closer Look At Inside (and outside) The Trends Institute. Spying from Facebook, now hackers. LUBBOCK (CBSDFW.COM) – Reactions continue after a Texas leader issued a public warning for what he calls a ‘civil war’ and possible invasion of United Nations troops if President Barack Obama is re-elected. Lubbock County Judge Tom Head is convinced that Mr. Obama winning a second term would lead to a revolt by the American people and he’s is pushing a tax increase for the district attorney’s office and the Lubbock County Sheriff’s Office. He says the money is needed to “beef up” its resources in case President Obama wins the November election. On Thursday, KRLD NewsRadio 1080 spoke with both Republican and Democrat officials in Lubbock County, regarding the judge’s recent comments to a local Fox television station. “We certainly don’t agree with the President and a lot of his policies, but I don’t see any U.N. troops coming to invade Texas anytime soon,” said Lubbock County Republican spokesperson Carl Tepper. The Democrats in Lubbock aren’t laughing. “It’s ridiculous. It’s very embarrassing for us here in Lubbock,”Commissioner Gilbert Flores said frustrated. During his interview Judge Head said that in the event of civil unrest he’s concerned the President would hand over sovereignty of the United States to the U.N. and that the American public would react violently. “He’s going to try to hand over the sovereignty of the U.S. to the United Nations, what’s going to happen when that happens?” Judge Head told FOX 34 in Lubbock. The West Texas judge’s proposed tax increase is to help the sheriff’s office hire a law enforcement large enough to protect the county and to drive away the invaders. The republican judge said that he himself will meet the enemy, “in front of their armored personnel carriers” to tell them they are not welcome, and has the county sheriff to back him up. “I don’t want U.N. troops in Lubbock County,” he said. Tom Head, a graduate of Highland Park High School, has been a county judge since 1999. The government PR machine has swung into high gear promoting West Nile disease. It’s a “national outbreak.” 1138 cases in 38 states. 41 deaths. Planes are spraying toxic aerial pesticides. If you added up the death count from all the hyped and predicted epidemics of the last decade, including West Nile, SARS, bird flu, weaponized smallpox, and Swine Flu, the total would come to about one year of deaths in the US from ordinary flu. But who cares about facts? What’s important is how much fear can be generated. That’s the statistic that counts, when you’re talking about the CDC or WHO. Other people, involved in natural health, who reject huge amounts conventional medical wisdom, nonetheless make the mistake of buying the virus of the moment. They automatically accept it as real and then figure out how to treat it naturally. That can be a big mistake. Have researchers ever actually isolated (found) the West Nile virus? You should be asking that question. You should always question what the CDC tells you. The deepest form of medical-research chicanery comes when scientists claim they’ve found a new virus and they haven’t. They haven’t nailed it down. They say they have, but that’s not true. People have a hard time fathoming this. They will accept the fact that a medical drug touted as miraculous really causes heart attacks, strokes, and death, but for some reason The Virus is sacred territory. “Scientists would never lie about that.” Really? Why not? Do you think discovering a new virus is like dipping a tweezer into a dish of liquid and picking out a little critter who is shaking his legs? And therefore, nobody can lie about it, because it’s either there or not? No, that’s not the way it works. A new virus is discovered by taking a tissue sample suspected of harboring it; then that sample must be transferred to a fine filter that will trap the virus. That’s how the initial all-important isolation process is begun. Researchers claim the West Nile virus is 0.04 micrometers. At the same time, they admit that the original fishing expedition for the virus employed filters that were 0.22 micrometers. The obvious conclusion? The filter was too porous. It was nearly six times larger than the virus. People getting sick and dying doesn’t necessarily have a connection to why health authorities are telling you they’re dying. If a newspaper reported that a hurricane in Missouri killed 12 people, and then you discovered there had been no hurricane, would you insist on pretending there was, because 12 people died? No, of course not. You would assume the people died for other reasons. It’s the same situation with West Nile. People get sick and die all the time. If the virus that supposedly is causing an outbreak of illness has never been found, you look for other causes. A decade ago, independent journalist, Jim West, launched an original investigation into the so-called “West Nile epidemic” in New York City. West correlated clusters of human and bird “West Nile” cases with several factors; among them, nearby polluting oil refineries, other air pollution (certainly exacerbated by hot summer weather), and the presence of toxic MTBE, an additive that makes gasoline in cars burn cleaner. There are listings for at least eight refineries in the Dallas area. There are also reports of increased air pollution coming from natural gas production in the Barnett Shale. The 2012 summer has been hot. As of of the year 2000, Texas refineries were producing 75% of all the MTBE in the United States. And since this has been a very hot and dry summer in other areas of the US, high-air-pollution locales have intensified. Am I saying that the never-isolated “West Nile virus” might be functioning as a cover story, to conceal what is really making people sick? Absolutely. As an illustration, the medical history of the African continent is replete with such cover stories. Over and over, germs have been heralded as the cause of people dying in great numbers. Centuries-old causes of ongoing death in Africa were intentionally overlooked: contaminated water supplies; horrible sanitation; overcrowding; generation-to-generation malnutrition and starvation; stolen farm land. Most Americans automatically assume the arrival of western doctors with drugs and vaccines is a good sign for Africa. Nothing could be further from the truth. The doctors are sent there to cover up the truth. Why? Because many interested parties, powerful players inside and outside of Africa, want the true and persisting causes of illness and death to remain, in order to keep the population weak and controllable. It’s easy to hide this agenda by advertising a fake disease-cause and a fake medical remedy. Medical intervention will never cure what’s ailing Africa. If you walked through a swamp of filthy contaminated water every day on your way to work, do you think a course of antibiotics would keep you healthy? Here in America, when various toxic environmental causes of illness bring people down, there needs to be a cover story as well. The most believable cover is The Virus. It works. People stand up and salute it. They’re saluting it now in Dallas and other places. I don’t care how many pictures of how many mosquitoes are adorning television screens and newspapers. “Oh, the mosquito carries the West Nile virus!” Really? Even if no one ever found such a virus? Buy the virus story if you want to. Everyone has that freedom. But science is supposed to be about proof, and in the case of West Nile, it’s all supposition and presumption and lying. How many people will give in at each new barrage of propaganda and accept the virus story? Remember Swine Flu? The whole planet was going to go down. In the end, WHO announced the total global death figure as 20,000. Then, in a mindless burst of revisionism this year, the total was changed to 580,000. Here’s a number for you. Three maniacal spokespeople from the CDC, backed by five major television networks, can brainwash the public about a virus in seven days.